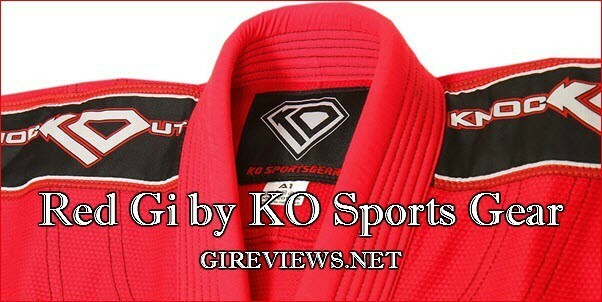 When I first saw the red KO Sports Gear gi I was intrigued given its low price point ($89.99). The company offers a variety of products at very reasonable prices, and I was curious to see if their quality made their products worthwhile. 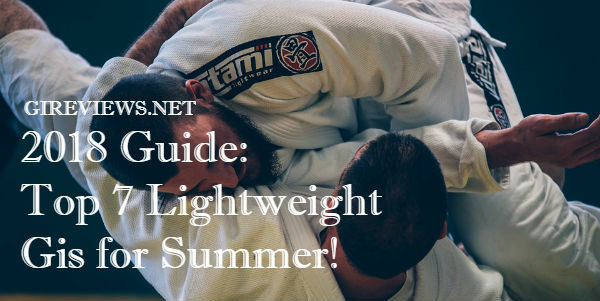 This gi is certainly not a premium product, its fit isn’t the best, and there are some quality control issues, but it performed well over the course of a 6 months test period and I was really impressed by how tough and durable the gi is. 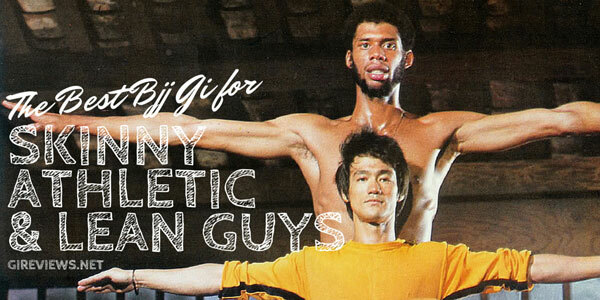 If I were stockier this gi would fit me perfectly. It should be noted that since the release of this model KO has reworked some of their sizing. 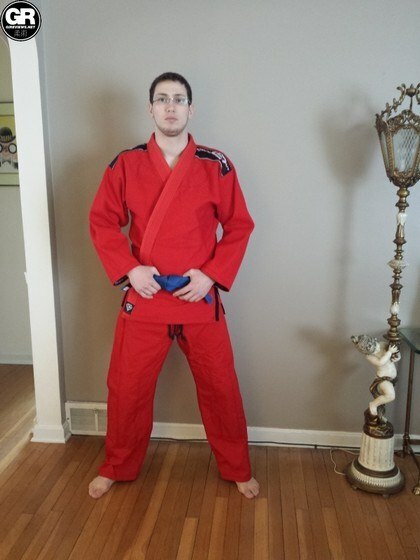 This gi is RED. I think that that just about covers it. The 550 GSM pearl weave jacket has a logo patch on each shoulder, and a single small logo patch at the bottom of the left lapel. The pants have a single small patch near the right hip. All of the seam tape is branded KO Sports Gear tape, and the piping, pant loops and rope are all black. 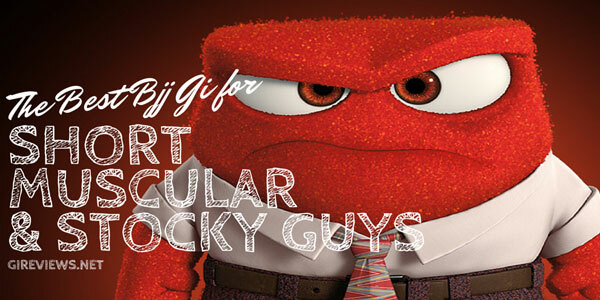 Did I mention the gi is red? Perhaps the most impressive part of the experience of reviewing this gi is that it didn’t fade at all. I’ve seen many premium brand gis put out products in unusual colors and have those colors fade. This is a big achievement for KO Sports Gear in my book. The jacket fits decently, the arms are a bit short and baggy but otherwise it’s perfectly wearable. 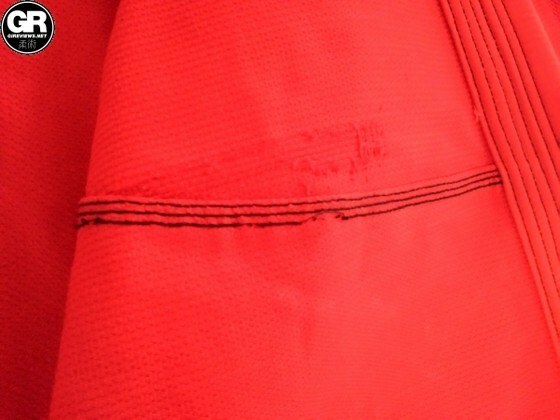 I did notice some quality issues when I first got the gi including loose stitching which later undid itself as well as several issues with quality control of the fabric. 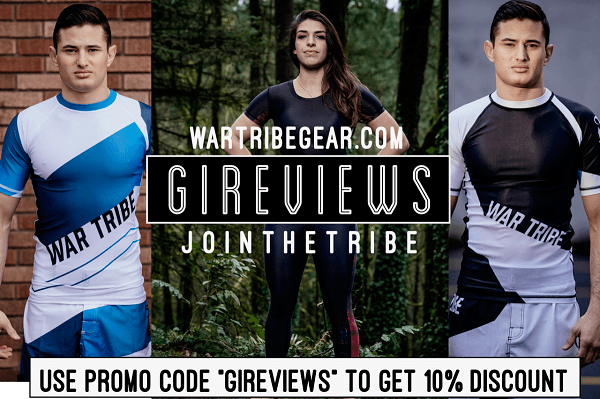 I tested this gi for a long time to see if it would break down further and was pleasantly surprised to see that it held up as well as any premium gi that I’ve reviewed in spite of any possible issues. Another issue initially was that the seamtape was scratchy but as the gi got broken in this wasn’t really a big problem. The gi has a very nice thick lapel made from EVA foam with ripstop covering. The pants are big, but otherwise totally acceptable. There were no quality issues with the pants. They are made of a nice soft ripstop and have stretchy rope for the waist closure tied in a knot and then melted. The pants do not have any pearl weave (which I always love to see in a gi) in the gusset, but they do have a double layer of fabric from above the knee to right below. 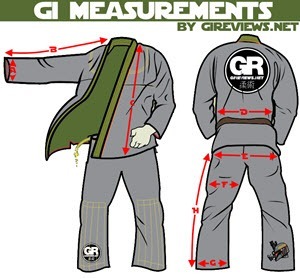 All things considered this gi performs well. The unusual fit actually gives me a slight competitive advantage when rolling as some standard grips are more difficult to acquire on this gi. 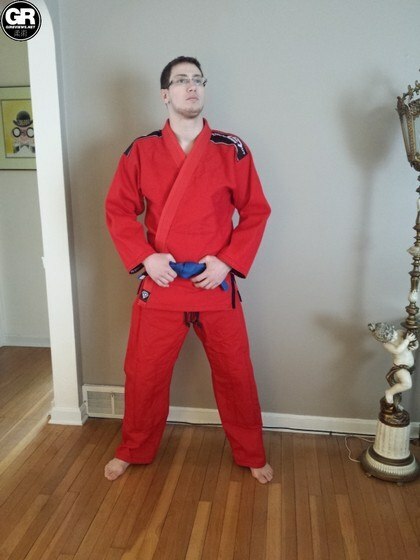 After I put some wear and tear on the seamtape the gi became very comfortable. The thick lapel was a nice touch to make grip retention more difficult. For a gi that costs under 100$ KO Sports Gear put together a great product. 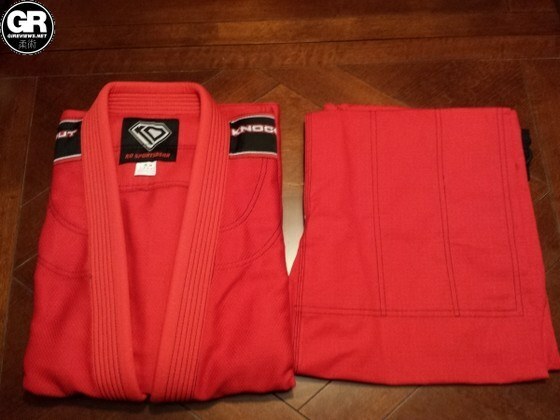 This is not a “premium” gi but it comes in a very unusual color that held up very well over time. It doesn’t fit me like a “tailored suit” but fits well enough to be worn comfortably. Disclosure: This Gi was submitted to me free of charge (by way of gireviews.net) for review. I have never done any work with or for KO Sports Gear.